"Traditional identity and access management (IAM) systems were developed to identify humans, not machines. To cope with the new connected IoT world, IAM leaders must extend identity management to encompass all entities—humans, devices, applications, and services—in IoT ecosystems. This extension of IAM is known as the Identity of Things (IDoT), and it works by assigning unique credentials, keys and identifiers (UID) to all entities in an IoT implementation. Unique identities enable secure communications between a device and a human, a device and another device, a device and an application or service, and between a human and an application or service. Additionally, device manufacturers and enterprises may want to inject credentials—PKI is generally the best choice—for operational control and secure updates." but so far was not typically embedded in small peripheral devices. 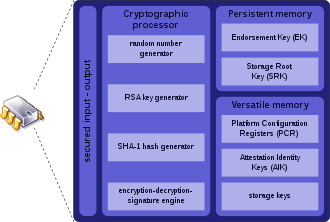 The endorsement key is a 2048-bit RSA public and private key pair that is created randomly on the chip at manufacture time and cannot be changed. The private key never leaves the chip, while the public key is used for attestation and for encryption of sensitive data sent to the chip"
"MIT researchers have built a new chip, hardwired to perform public-key encryption, that consumes only 1/400 as much power as software execution of the same protocols would. It also uses about 1/10 as much memory and executes 500 times faster."